This five-day program presents Lean concepts, tools, and methods essential to the Toyota Product Development System (TPDS). Collectively, these objectives will prepare you to implement Lean development in your organization and bring your best ideas to market as effectively and quickly as possible. Attendees regularly see process improvements ranging from 30–60% reduction in lead time, 10–20% reduction in rework, and better communication between departments. Each day offers a set of learning objectives that enable product development engineers and new product team members to understand and appreciate the Lean product development process and its tools. John Drogosz, Ph.D. is a Senior Lean Consultant at Optiprise, Inc. with close to 20 years of experience. He conducts Lean Enterprise Rapid Improvement workshops at Northrop Grumman Ship Systems and Value Stream Mapping and Rapid Improvement workshops with Johnson Controls in Asia. Dr. Drogosz, a Six Sigma Black Belt, teaches Lean accounting, Lean engineering and Lean manufacturing at the University of Michigan. In addition to course slides and case studies, The Toyota Product Development System: Integrating People, Process, and Technology is provided as part of the course. This textbook illustrates specific techniques and proven practices for dealing with challenges associated with product development, such as synchronizing multiple disciplines, multiple function workload leveling, compound process variation, effective technology integration, and knowledge management. Experience Lean product development through a practical two-stage simulation that condenses the typical product development cycle. 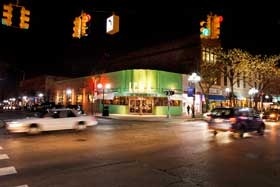 When class is finished for the day, enjoy a casual night out with your classmates in an organized excursion to one of Ann Arbor's many great restaurants.